Holgate Windmill is the only remaining fully working windmill in York. 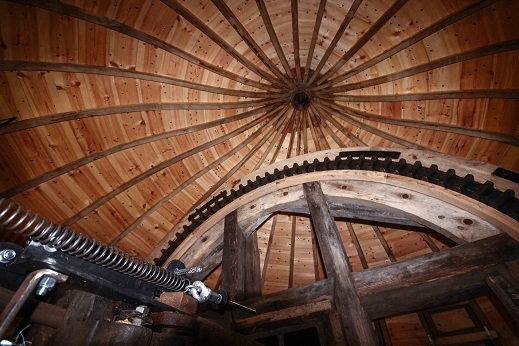 At one time there were 20 windmills, 4 watermills and, latterly, 6 steam driven mills! 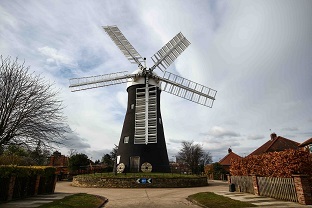 The Holgate Windmill Preservation Society (HWPS) was formed in 2001. Holgate Windmill has recently been restored by an enthusiastic team of volunteers and is now fully operational again. Opening Hours.The Mill is open on Bank Holidays, for a weekend during February (half term), and for at least two weekends per month from Easter to the end of October. See website for exact dates and times. Access: Visitors with limited mobility may be able to access the Ground Floor via a short flight of stone steps with strong railings. There we have a screen showing photographs and a DVD of all levels of the working mill. The stone floor. Photo by Nick Ansell. Refreshments. The Carlton Tavern is just past Grantham Drive towards Acomb and serves good food and drink if you are in need of refreshment before or after your visit. Stoneground 100% Wholewheat Flour milled on site is on sale in three sizes : 500gm, 1.5kilos and 5 kilos. 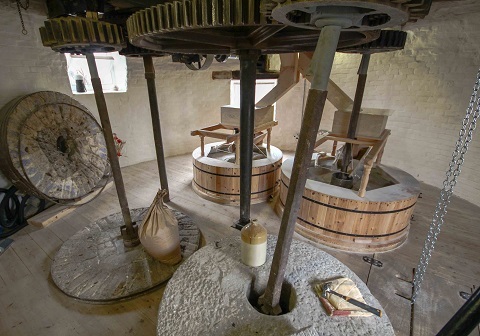 You can buy our flour from the mill every Saturday morning from 10am to midday, on open days, and sometimes on a Friday when we are milling (weather permitting – if the sails are turning then we will be there!). You can also buy our flour from several local outlets in and around York . Inside the cap. Photo by Nick Ansell.